With all the comedy/horrors coming out these days, it is hard to sort the comedies from the horrors and then the comedy/horrors. I'll tell you now, Zombieland (2009) is one of the best, if not the best, comedy/horrors out there. This was like the gorey version of The Hangover. In a world where the human race has almost been completely wiped out by zombies, there are four very special human survivors. First are Columbus (Jesse Eisenberg), a guy trying to go to college but also trying to survive, and Tallahassee (Woody Harrelson), a tough guy who wants Twinkies and to kill all of the monsters. On their travels, they meet Wichita (Emma Stone), a hot girl who steals money for a living, and her younger sister Little Rock (Abigail Breslin). They band together to try and make it through life, and not become a zombie. You have no idea how stupid this film sounds. But the trend in Hollywood seems to be this: make a movie with a stupid storyline and the critics/public will love it. Make it too complicated and they won't. 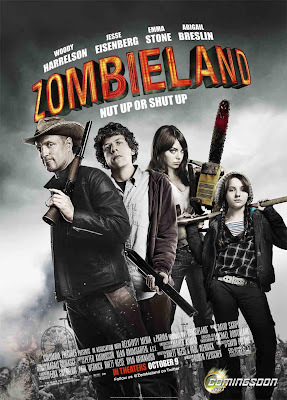 Zombieland succeeds in being both a comedy and a horror, but it is first and foremost a comedy. The performances are sharp, in fact the whole thing is sharp, but the real shiner here is the script. Be prepared for one of the coolest movies to surface last year.